I am a relatively new convert to twitter and I still primarily use it as a resource to follow the people and organizations that I am interested in. Looking at my twitter “friends” list, the majority of the twitter accounts that I follow, I follow because of a professional interest rather than a personal interest. These accounts generally fall into the following categories; designers, marketing/social, data visualisation, infographics, Flash/Flex design/development and interactive agencies. 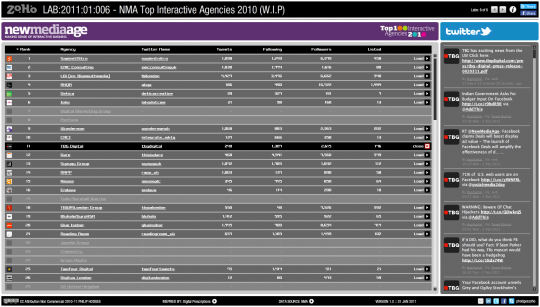 The NMA Top 100 Interactive Agencies list published each year by New Media Age has always been especially interesting to me, partly because of my obsession with “best of lists” but also because it provides me with good list of potential clients. Over the years it has become a bit of a yearly ritual to browse through each agency’s website, see what each one is up to and especially see who is producing work that seems in sync with the sort of design and development services I offer. Those that looked like a good match I would email off an introductory email to. These emails would normally go out about the end of Jan, rather than back in November/December when the list came out, and would basically be an introductory letter saying “Hi, think what you guys do is cool, please look at what I do, really hope we can work together some time”. Some years the response has been surprisingly successful and on several occasions has resulted in both contract and ongoing freelance work. This year, because of my newly formed love of all things twitter, I was keen to hunt down each agencies’ twitter account and add them to my quickly growing list of “friends”. So an optimistic Google search for “NMA Top 100 Interactive Agencies + Twitter” lead me straight to Jordan Stone’s blog page “The 2010 NMA Top Interactive Agencies on Twitter” where I was delighted to find he had already tracked down about 80% of them and it was a quick and easy process to scrape that list into a database. I decided to keep the first version of this interactive pretty simple. 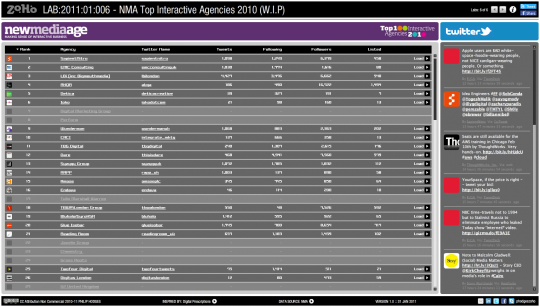 It is basically a twitter client that allows the user to browse the latest tweets from the NMA Top 100 Interactive Agencies list collectively or by each individual agency. The agency list is presented in a simple table format so the user can sort by friends, followers, tweets etc. I plan to revisit this interactive twitter client in the future as there is potentially a lot more I can do with the data available through the twitter API and I plan to add an overview page for each agency that shows it’s tweet timeline with hash tags, mentions and source (via) summaries and also any content trends. Also an overall summery page showing any trends across all the agencies. If I have missed any agencies’ twitter account than please let me know. This entry was posted in Flash ActionScript, Interactive Data, Lab Examples and tagged Actionscript, API, Data, Interactive, New Media Age, NMA, NMA Top 100 Interactive Agencies, Twitter. Bookmark the permalink. Post a comment or leave a trackback: Trackback URL.